TOKYO, Sept 19, 2018 - (JCN Newswire) - Fujitsu Laboratories Ltd. has developed an ultra-high capacity wavelength-division multiplexing system that considerably expands the transmission capacity of optical fibers in optical networks connecting datacenters. The new technology achieves this without the deployment of new transceivers dedicated to new wavelength. Previously, in order to expand transmission capacity between datacenters, operators had to either increase the number of optical fibers being used, or they needed receivers supporting each band of wavelengths. 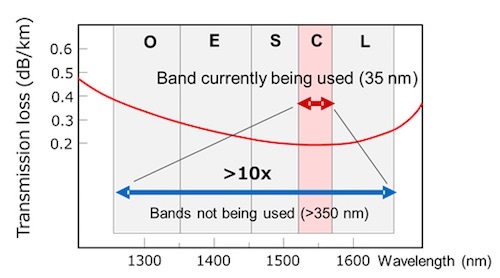 Now, Fujitsu Laboratories has developed the world's first broadband wavelength conversion technology that can batch convert C-band(1) optical signals to new wavelength bands, including L-band and S-band, reconverting them back to the original C-band when received. 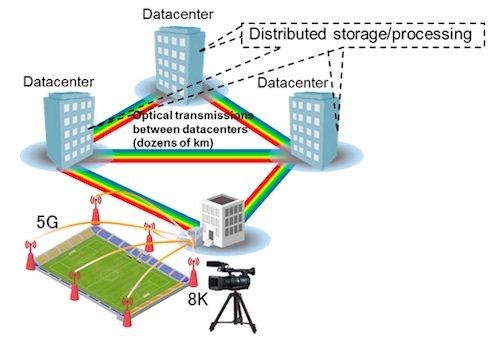 Upon development of a system that converts optical signals in C-band to L- and S-bands before multiplexing and transmitting them utilizing this innovative technology, Fujitsu Laboratories successfully demonstrated in principle that transmission capacity could be tripled. This allows datacenter operators to use existing equipment as-is to raise the efficiency of optical fiber utilization and thereby expand transmission capacity. This promises to eliminate the kind of network bottlenecks that could pose challenges for high-volume users that need to store, back up, or perform parallel analysis on large volumes of data distributed between multiple datacenters. This includes cases that many expect to increase dramatically in the near future, such as transfers of unstructured data including 8K video material and device log information connected through 5G networks.